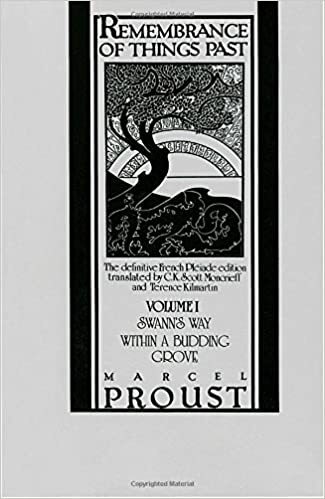 Jumbled thoughts on a luxurious, slow read of Proust – loudlatinlaughing – Euge! Euge! Reading Remembrance of Things Past—I prefer Moncrieff’s translation and not the In Search of Lost Time translations that attempt to correct his lyrical embellishments, but perhaps I should just say À la recherche du temps perdu to avoid any confusion—I’ve granted myself the luxury and extreme pleasure of a long, slow read. The work is lengthy, a novel in seven parts spread across three volumes. I’m still sipping Swann’s Way (which itself is broken into four pieces: Overture, Combray, Swann in Love, and Place-Names) but having fought my way through Swann in Love, I needed to come up for air and note just a few things. SIL was hard to get through, excruciatingly painful to see Swann’s discomfort of being in love with the odious Odette. But that’s the point, the sharp jealousies and ecstasies of love, the pitfalls and triumphs, the heady early days melting into tedium and apathy. You are a formless water that will trickle down any slope that it may come upon, a fish devoid of memory, incapable of thought, which all its life long in its aquarium will continue to dash itself, a hundred times a day, against a wall of glass, always mistaking it for water. And I should have liked to be able to sit down and spend the whole day there, reading and listening to the bells, for it was so charming there and so quiet that, when an hour struck, you would have said not that it broke in upon the calm of the day, but that it relieved the day of its superfluity, and that the steeple, with the indolent, painstaking exactitude of a person who has nothing else to do, had simply, in order to squeeze out and let fall the few golden drops which had slowly and naturally accumulated in the hot sunlight, pressed, at a given moment, the distended surface of the silence. I naturally gravitate toward the section that is all about long walks and reading. One more section and I’ve finished the first part of the seven!